If it’s a smoother surface finish you’re after, then the AutoComp Elite® On-Car Brake Lathe system is for you. The system stops chatter before it starts thanks to its revolutionary Anti-Chatter Technology. Through oscillating speed, the brake lathe all but eliminates the buildup of vibration, or chatter, that can happen when machining rotors at a fixed speed. That means you’ll have no need for silencer bands that introduce hazards to the process. In addition to its revolutionary anti-chatter technology, the lathe uses exclusive precision machining and Hunter’s patented Variable-Speed Drive System. This allows for the fastest possible speed without sacrificing quality. It’s all in the timing with AutoComp Elite®. The system will increase your shop’s profits through consistent compensation times under 12 seconds (average) and cuts that are twice as fast as standard machines. The AutoComp Elite® also maximizes service time and saves two minutes per rotor. 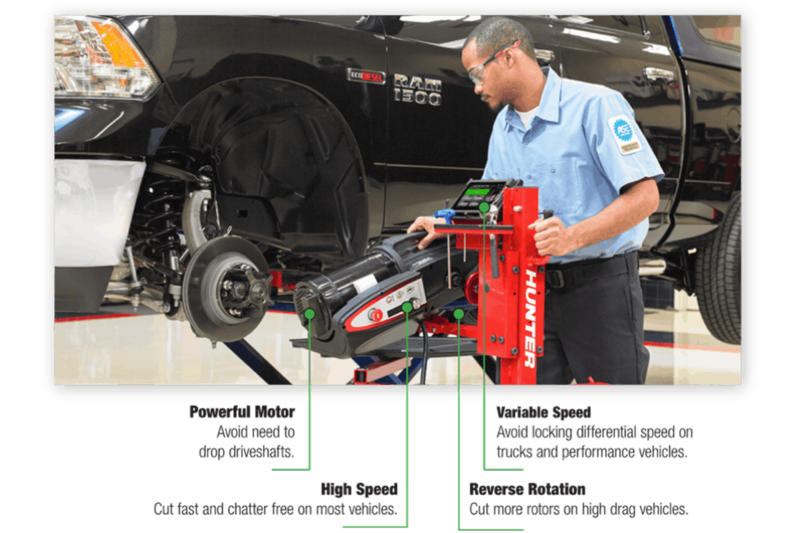 Your technicians won’t need to disassemble drive trains because of its powerful motor, reducing your labor costs. There are three models to choose from – the AutoComp Elite® Lathe (ACE), the Auto Comp Elite® Lathe: Passenger (ACEPAS) and the AutoComp Elite® Lathe: Pro (ACEPRO). Customers are raving about the equipment noting its reliability, ease of use and timesavings. See the equipment in action; then, give us a call to see how we can help you bring this profit-building equipment to your shop.